Wow I love these! They look so simple to make yet so effective, and the possibility of colours/patterns is endless. Thanks for sharing! wow.. they look so decorative .. hand made ones give you a pleasure and satisfaction..
so cute.... haven't used napkin rings in ages. Love all your handcraft stuff. 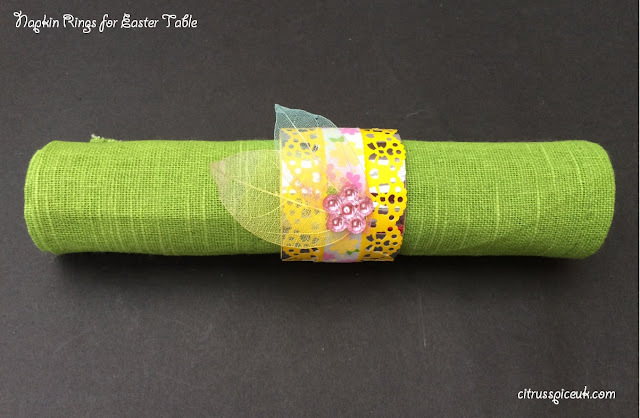 This is a great way to add that something special to your Easter table- great post! These are glorious! Love Easter for getting crafty - bright spring colours will make your Easter table look wonderful. These are really pretty, you would never believe they began life as a toilet roll middle. They look quite easy to make and would look lovely on any table. Wow, they looks lovely and they are so easy to make! Thank you so much for the inspiration. aww this looks so pretty and fun to make! These look great, my little ones would love to make some for their nanny as a gift. How adorable. These look great! These turn out really cute. I;d love to make some for an Easter party. What a fantastic Easter craft, such a fab idea! This is so cute. Loving the idea a lot. Aw these are adorable I love the colours ! Now I just need to try and replicate it myself! Such a great Easter project! My kids would love to make something like this, I am sure! They are so pretty and you wouldn't know it was toilet roll at the base. These are so great, my daughter would love making something like this too!